We’re planning a road trip from Connecticut to North Carolina in the next month or so, and we’re taking our two dogs, Lola and Charlie (yes we know about the kid’s show, Charlie and Lola, which is why I reversed their names here). Lola is a 12 1/2 year old Gordon Setter and Charlie (4 years old) is everything else, with long lashes that’ll make most women weep with jealousy. When Chris and I started petswelcome.com, it was so we could find pet-friendly lodgings for ourselves and our pets and other pet owners—and 15 years ago there were only a comparative handful. Now we have almost 35,000 pet-friendly venues throughout the world. 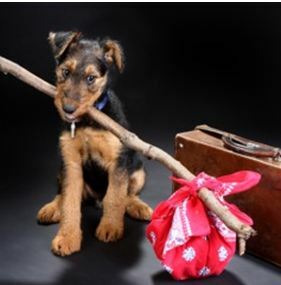 We’re taking our laptop (and smartphones) along so we can always find a pet-friendly hotel on www.petswelcome.com. In addition, we know if there’s a problem with one of the dogs, we can always consult our list of Emergency Vets along the way. Our final planning will be to consult our Search by Route application on our site. All you have to do is put in your Departure city and your Destination city, and not only will it plot your trip on a map, the pet-friendly hotels will show up along the route. Our first stop will likely be Washington, DC and we’ve already found a number of available pet-friendly hotels there. But first things first: What do we take with us to make sure our pets are safe and healthy? Here’s a partial list that everyone can use. Identification on their collars, including name and contact numbers. If your pet has a microchip, make sure it’s updated with your current contact information. Medical Records including their current conditions and any medicines you’ll need. If you have a proof of vaccinations (especially Rabies), take that along with you. Crate, if your pet still needs one. Bedding and/or blankets, and towels for those rainy days or swimming in a lake. Combs and brushes and other grooming supplies. Toys (don’t forget that on a long trip, they’re going to get bored. Food (dry and/or canned), along with their bowls. We take a mat along to go underneath the water bowls to keep the floors dry. Water for the car trip. We used to bring water from home when we traveled so they’d have familiar water, but as soon as we reached our destination, they’d jump into the lake, or start sipping from a puddle. Appropriate first-aid kit. We have long-haired dogs so we make sure we have tweezers for those pesky ticks. Don’t forget those monthly items like Heart Guard or Frontline, or whatever other protection you use. As we travel, I’ll try to blog about where we are and what we’re doing, and about how the dogs are enjoying the trip. If you have suggestions about what to take with you when taking a road trip, let us know. We welcome your feedback. One tip that comes in handy for us when traveling: We bring our own water from home too, but frozen. We freeze water in ‘safe’ (check label) plastic food storage containers and then sit the open container in a mini lunch cooler in the back seat for the dog. We wrap dish towels around the container within the cooler to help insulate it and can use them to wipe her down if need be. It works great and lasts a LONG time! It also keeps her from ‘guzzling’ water, so it helps prevent car sickness too.